Mix all ingredients together in a Temp-tations bowl, making sure that the sugar is dissolved. Pour into the Temp-tations Crème Brulee ramekins. Place the filled ramekins into the tray included with the set. Fill the tray 1/3 of the way up with hot tap water, creating a water bath, and place the tray in the preheated oven. Bake for 45-50 minutes or until set. Remove from oven and allow to cool on your counter. Remove the ramekins from the water bath and cool completely in the refrigerator for 6 hours or overnight. 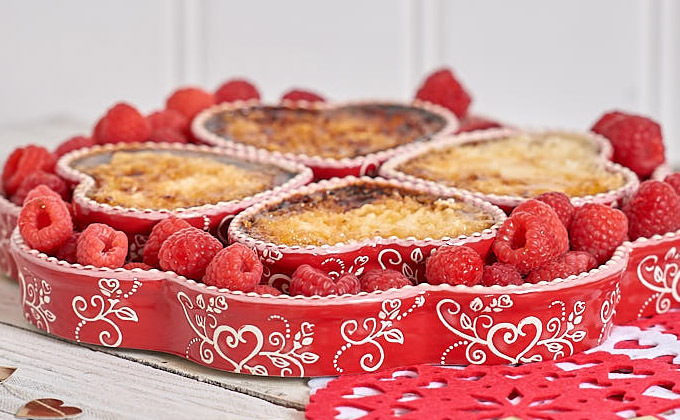 When you’re ready to serve, sprinkle the top of the crème brulee with a ½ tablespoon sugar and place under your broiler until the sugar is caramelized.